Before I get into the winter squash, a quick update on the girls: At last week’s exam, our veterinary ophthalmologist liked the way Millie’s eye was?responding to the surgery, though she?cautioned it could still be a couple of weeks before we could determine if the inflammation inside her eye had completely?resolved. But over the weekend?Millie seemed to suddenly start navigating around much more crisply, and this morning I watched her walk out of my office, down the stairs, and into our bedroom (through a doggie gate) as if she could see everything just fine. She still has a cone on her head — it comes off tomorrow! — which also affects her ability to negotiate objects. It’s particularly difficult for her to get around with a cone because with only one eye, she doesn’t have the depth perception to judge distances easily and accurately. So once we remove the cone, I think we’ll have a?much?better idea of her visual ability. And on Friday, our internal medicine specialist called to say Darla’s urinalysis results indicated her kidneys were working better than expected, so we don’t need to start her on medications yet. That was good news, too! Okay, now for a bit about the garden. 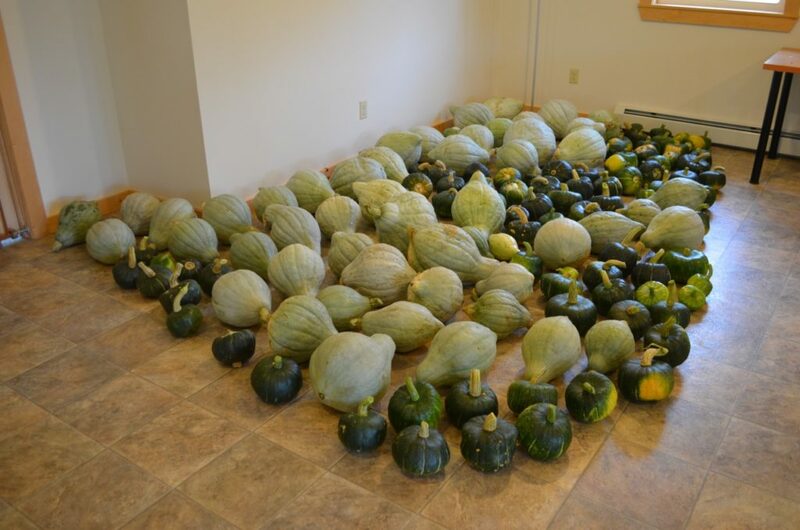 On Saturday Alayne and I finished harvesting the winter squash, and as you can see, we ended up with a ridiculous amount! There’s a total of 141 squashes, divided between the big Blue Hubbards and the smaller Burgess Buttercups. In prior years we experimented with many different varieties of squash, but found these two were the hardiest, most consistent yielders of the long-storage types, so this year that’s all we grew. 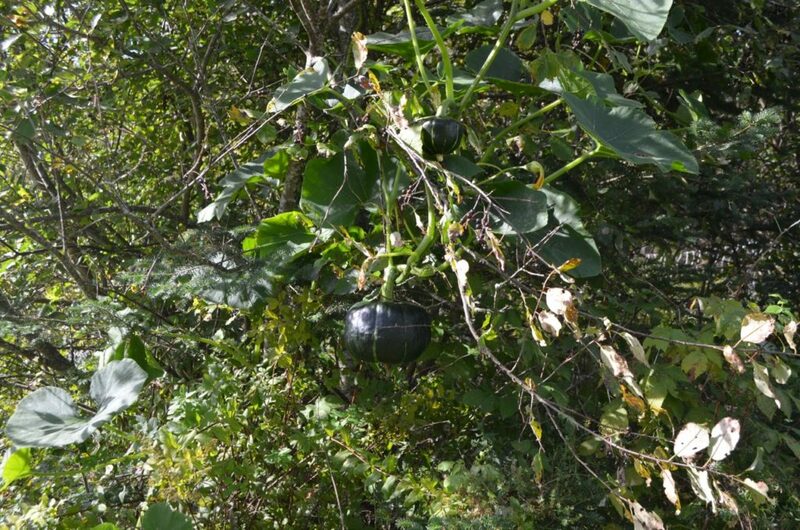 The Blue Hubbards were a mainstay in the colonial era, because they grew to enormous size — a single squash could feed a large family for dinner — and kept all winter long if stored properly. Indeed, we have a large Hubbard from last year’s crop that is still good — 12 months later! Now, at this extended age they don’t have much flavor left and are kind of bland, but if you were short of food in the 1700s and 1800’s, Blue Hubbards could tide you over to the next harvest. 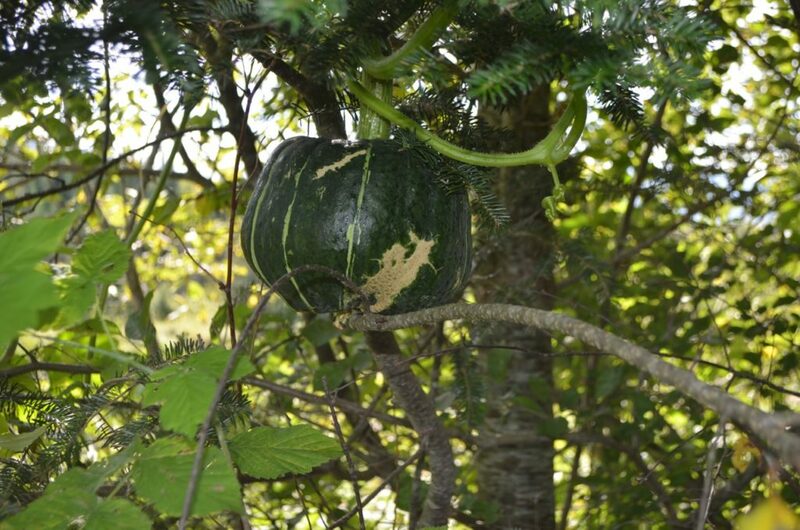 Interestingly, it wasn’t only winter squash that lasted us a year. We were still enjoying our onions, potatoes and carrots from the previous year’s harvest when the new crop came in this summer, so we literally went harvest to harvest on those crops, too. The key is selecting varieties that are good for long-term storage and then storing them well. You may well wonder what two people are going to do with so much squash. Good question! One reason we grew this size crop is because we also use squash to feed our laying flock over the winter. The hens love it, and it’s a warm, satisfying food on a cold winter’s day. During last winter we provided half of the flock’s entire feed ration from our own gardens — squash, potatoes, greens, carrots, and our own leftovers and kitchen waste (vegetable peelings, etc.). This winter we should do even better than that. And yes, depending on their diet and preferences, some of the dogs get to enjoy winter squash, too! I just love your posts and your sanctuary! I know you do not allow visitors (per se) but I would love to visit even if just to help you both work the fields, etc…. So glad to hear the girls are doing well. I have to say, that’s a LOT of squash. It’s a riot to see the one in the tree. Luckily, it seems to be resting on the branch below it. I’m not sure how much longer it could hang there without the branch if it got any bigger. Those are lucky birds who get to share in the home grown veggies. Your tree squash is amazing! Not to mention the sheer size and number of the rest of the crop. I’m so glad that Millie is able to see, and that Darla is doing OK. I tied my napkin around my neck, grabbed my fork and knife and am heading out the door to help you folks with all those squashes and carrots! Good news for the girls, thank heaven! so interesting about the squash! I love your posts and everything about your farm. thanks for bringing the joy, I know its incredibly hard work. Glad to hear the news of the good reports on Millie and Darla. And I love reading about how much you are able to do with the harvests. That is awesome.